Welcome to the Multiplayer Operations Center for Misty's Place. Here you will find tips and tricks for MultiPlayer operations, FAQs for getting started with FS2004 MultiPlayer (MP), TeamSpeak (TS) and FSNavigator (FSNav). Many people are intimidated by MP, and it does take a little practice. 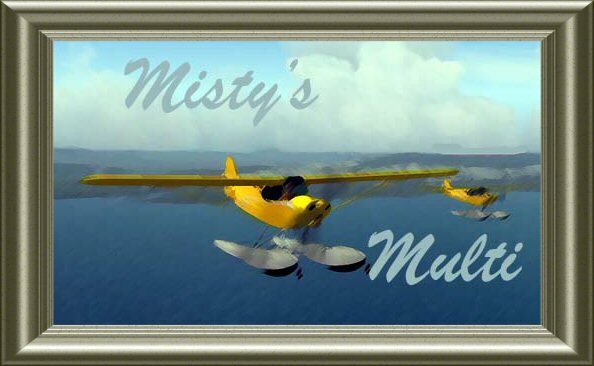 But our goal at Misty's Place is to have crowded skies with all our friends flying together and enjoying the company of other virtual pilots in our area. The information below will get you up and running and we even have 2 or 3 "instructors" that will be happy to help you get started. At the right is a dropdown that lists the instructors available to help you get started, when you choose one, you are sending an email that is asking for help in your particular area of need. MM: Open Port for firewall "23458"
start any weather program you usually use. Tick whatever boxes you think you need. click OK...this is a one off.. these settings will remain every time you open multiplayer. in player name type in the name you want others to see.. your tail number or your nickname..it's up to you. hit the search button and you should see " VirtualPilot Open Session" appear. highlight VirtualPilot Open Session in the rooms that drop down then click on "join" bottom right. A green message band will appear at the top of your screen in flightsim. you are in multiplayer! press the enter button on your keyboard and the chat screen will show up. to close it use the X at top right of the chat screen. Type ?help in the communications line, and a list of chat screen commands will come up. For those that have Teamspeak. Open teamspeak, and click on connection. Label Box: fill in the label box by typing "Misty Moorings"
Server Address: Type in 67.38.117.12. User Password: Type in "mmfun"
It will ask you for a password, type in "mmfun"
Click on Misty Moorings and it will "Switch Channel" for you. 3. Select Options from menu bar. Note: FSNavDBC, the FSNav Database utility which came with FSNav, needs to be rerun every time new sceneries are added to FS9, otherwise the new airports will not show up on the FSNav program for you. 1. Can we use REAL WEATHER with MultiPlayer? 2. Crash Protection and MP flying? 3. FSNavigator and MP Flying? 5. MP and running a firewall? 6. Why do people NOT see the plane I am flying? 7. Why don't the new sceneries show up on FSNav? 8. Multiplayer Times are in GMT or Zulu ... what is that in MY time? 1. Real Weather and MP? 1. Sure you can use real weather. However, I suggest that an agreement be reached among all MP'ers so we are all seeing basically the same thing and all use the proper runway. 2. Should we turn off Crash Protection with MP? Yes, you should usually turn off crash detection in MP but doing so can make it where a float plane will not start correctly at a dock parking spot or cause problems when you are landing. With float planes, this contact with water will sometimes be considered as a crash and will throw your aircraft way up in the air. It's just better to leave crash detection on in this case. We'll just have to be careful not to run into each other. Crash modeling should be OFF, some have had to resart because someone else's plane floated into another plane while waiting on the ground. 3. FSNav and MP flying? Just to let you know... we have found in the past when doing MP on the Emma server that having FSNav connected causes crashes, kicks people off of the connection and a few other problems. We finally developed the rule that FSNav should not be connected to the MP server. I don't know if MS fixed any of it in the 9.1 update. I guess we could do a little testing. FSNav shows you the 'who', 'where', 'speed', & 'heading'. For now, FSNav is OK, but if we start getting many players, we may limit it later. 4. What should the target frame rate setting be? Framerates set to 20 or 25, any higher and it drags down the server. 5. How about running MP with a firewall? Firewall off, (antivirus, keep it ON!!!!!!!! ). Some communcations program that I have won't work with the firewall on. After the M/P session a person should do a scan with Spybot, Adaware etc. Also, sometimes if the firewall is on, some cannot get into M/P, others can. A good practice is to do a practice runup session before hand to iron out any problems. You won't iron out all of them, but between everyone you should be able to get things running fairly smoothly. Not sure if it is a good idea to turn your firewalls off, folks. They are there for a reason, after all If you dig a little bit deeper into your firewall manuals, you'll see there is an option allow certain ports. Emma Field is on the 'default one', all the others need to be specifically (or as a 'range') be 'allowed'. The port is (as indicated on the Misty site) 23458. That is also what needs to be set in the firewalls (from Francois). Both you and the other MP'er(s) have to have the same aircraft and the same repaint with the matching titles in the aircraft.cfg file for both of you to see the correct aircraft. Otherwise, you will see the last aircraft that the other player loaded that you do have. Most likely a default aircraft. Example: If a player reports flying the AN-14 with the Misty's repaint and you don't have it, you will see a different plane. 7. Why don't the new sceneries we add (airports) show up in FSNavigator? FSNavDBC, the FSNav Database utility which came with FSNav, needs to be rerun every time new sceneries are added to FS9. When you run FSNavDBC, it adds the new sceneries to the database and they will show up on your FSNavigator maps. Don - Jacksonville, FL - USN Retired Resident Extraterrestrial! Terry from Jackson Mississipp ... we know him as Teecee! Andreas - Innsbruck, Austria - a "REAL" sound engineer!